Ask Tom Zakrajsek and he will tell you that he is most proud of the skaters he had the pleasure of developing over the years to national and international success. His passion and style are a big part of the achievements of skaters such as Rachael Flatt, Max Aaron, Mirai Nagasu, Vincent Zhou, Jeremy Abbott, Ryan Bradley, Joshua Farris, Alexe Gilles, Ann Patrice McDonough, Brandon Mroz and Agnes Zawadzki. Steadfast in his beliefs to use sports science to educate and train his skaters, Tom is a passionate and committed coach. Every athlete Tom works with has their own carefully crafted plan for turning promise into performance. The skaters understand their long-term goals which are then broken down into shorter specific goals based on scientific principles and technologies. The athletes are educated along the way learning how Tom’s well-known and often shared knowledge of periodization translates into competition readiness. This is just how he rolls – or rather glides! As a successful national competitor and former skater with Disney on Ice, Tom turned to coaching in 1990. In 1996 he was invited to move to Colorado to coach at the Broadmoor World Arena. Drawn to furthering his education in response to criticism that the U.S. ought to employ more science in its training, Tom went onto to receive a Masters Degree in exercise science from the University of Colorado, Colorado Springs. This advanced education opened his thinking as to how and when to push an athlete towards finding the champion within. He incorporates the most important aspects of sports science to develop the skills and the spirit of champions within his skaters. This science-based knowledge provides new tools for his athletes to have quicker success in learning new skills. One example is how the body builds a myelin path from frequent repetitions to train the brain, then the nerves and finally to get difficult elements internalized within the muscles. Years of hard work and dedication have honed his coaching process and skills. The notable achievements of his athletes speak for themselves. 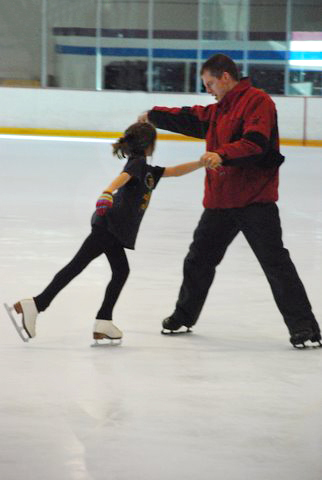 Tom has taught triple axels and quadruple jumps to more different male skaters than any other coach in the U.S. A complete list of his skaters and their successes can be found here. As a lifelong learner, Tom’s story wouldn’t be complete without the deep gratitude he has for the lessons learned from many coaches along the way. These include Audrey Weisiger, Frank Carroll and Kathy Casey, as well as numerous members of the Professional Skater’s Association (PSA). 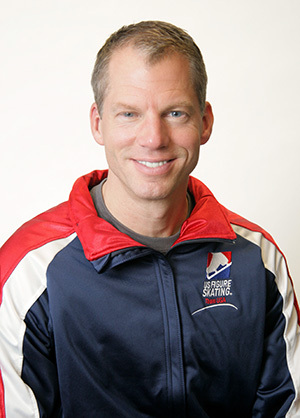 In 1999 United States Figure Skating awarded Tom the Developmental Coach of the year award. Tom began a highly successfully collaboration with Becky Calvin in 1999. They continue to work together to produce highly successful athletes and provide positive influences while teaching life lessons for all of the young children and adults with whom they work. In 2009 Tom received the prestigious award as the PSA Coach of the Year. In addition, Tom has been a keynote speaker at the PSA Conference in 2005 and 2010. Tom’s story is a work in progress as he continues to work with skaters from potential to pinnacle.